He himself followed precisely that method. The 7 Letras independent publishing house based in Rio de Janeiro released his first book of poetry, automatógrafo (automatograph) in 2011. The following year, he launched his prize-winning novel Glória (7 Letras) with a book trailer that he narrated himself. The publisher e-galaxia, which works with exclusively short form digital texts, published his 2014 short story Lígia. In 2015, again through 7 Letras, he published a chapbook of photos and newspaper cutouts called O escritor Victor Heringer (The Writer Victor Heringer). That same year, he was part of the publisher Luna Parque’s series “books in pairs” with his work Designação provisoria (Temporary Designation) in a partnership with Alberto Pucheu. His novel O amor dos homens avulsos (The Love of Solitary Men), published in 2016 by Companhia das Letras, was a finalist for the São Paulo Prize for Literature, the Rio Prize for Literature, and the Oceanos Prize. Victor used to say that the internet was his playground. In one of his columns for the magazine Pessoa he compiled an anthology of comments from news sites, which he called “public opinion’s crack district.” He learned to code in order to make digital books, ones in which hyperlinks folded into his poems, giving new meaning to footnotes. The internet, for him, was both form and content. And so the reader, upon clicking through the book, would open a window to another poem or a video or a song in a sort of twenty-first-century Babel’s library. Critics considered his last book, O amor dos homens avulsos, one of the best novels in recent years. The story takes place in the fictional Queím neighborhood in the suburbs of Rio de Janeiro during the 1970s. There, the life of a boy who uses crutches changes completely when his first love is murdered in a brutal hate crime. 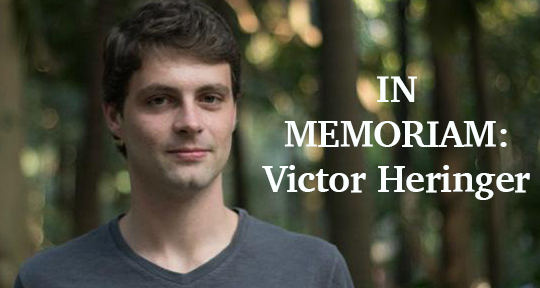 While he was writing the novel, Victor hurt his knee while running, a fact that he considered a “small miracle” that allowed him to write the character’s story viscerally. You can find a sample of the novel in English here. Translated from the Portuguese by Lara Norgaard. Rita Mattar was born in São Paulo in 1986 and is an editor at the Companhia das Letras publishing house where she also represents Brazilian authors abroad. She is working towards her Master’s degree in Literary Theory and Comparative Literature at the University of São Paulo and has a Master’s degree in psychoanalysis from the Sedes Sapientiae Institute. Alice Sant’Anna was born in 1988 in Rio de Janeiro and is a Brazilian poet. She is the author of Dobradura (“Folding”) (7Letras, 2008) and Rabo de baleia (“Tail of the Whale,” Cosac Naify, 2013), which won the 2013 APCA Poetry Prize (São Paulo Art Critics’ Association) and was published in the United States, translated by Tiffany Higgins (Toad Press, 2016). Her most recent book, Pé do ouvido (Companhia das Letras, 2016), was written while she was a Visiting Fellow at Brown University, in 2013, and is currently being translated into English by Eric Becker. Lara Norgaard is a graduate of Princeton University in Comparative Literature with a focus on Latin America. She teaches English and researches public memory in Brazilian literature as a 2017-2018 Fulbright Scholar in Brazil.